“THE MAN” tribute by Josh Budich! Stan “The Man” Lee passed yesterday at the age of 95. His impact on popular culture is immeasurable. I daresay that Nakatomi would not even exist if it weren’t for the worlds he helped create almost 60 (!) years ago with the likes of Kirby and Ditko. His “How to Draw Comics the Marvel Way” was a first real textbook in craft for many of the artists we work with here at Nakatomi. 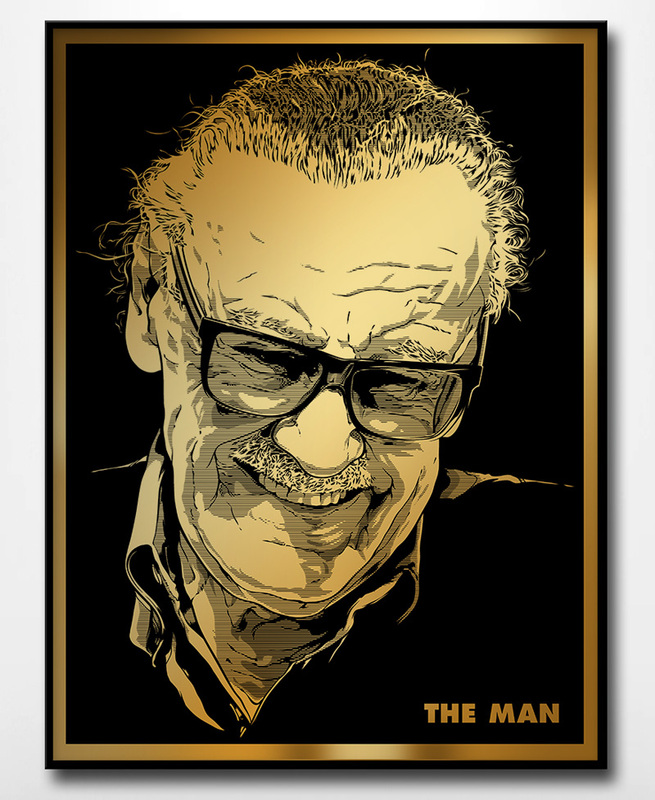 Artist Josh Budich has brought back his long-sold-out “THE MAN” print in honor of Stan- this time as a ‘Golden Age’ gold-foil edition of just 100 copies. Josh has requested 50% of proceeds be donated to The Hero Initiative– which assists comic book creators in need. On a more personal note- The Hero Initiative was a help to our good friend, Bernie Wrightson before he passed, and we’re very happy to give back to such a great organization. This 18×24 print is hand-printed on gold foil, and hand-numbered in a limited edition of 100 copies. This is a pre-order– print will ship in plenty of time for the Christmas holiday, if you were giving this as a gift! Print is available HERE NOW in the art print section of the Nakatomi store. We will update this blog post with donation info when it happens. ← MYSTERY TUBE SALE Tuesday 11/13 at 2pm Central!